The 23-year-old was stretchered off during the second half of the 1-1 draw with Stenhousemuir on Saturday and now faces up to 10 months on the sidelines. Thomson becomes the fifth long-term injury casualty at the club, on top of Kyle Benedictus, Chris Duggan, Lewis Vaughan and Tony Dingwall, although there is still some hope that both Benedictus and Duggan may return before the end of the season. But for a team hoping to win promotion via the play-offs, the injury situation is reaching a critical point. “It’s a massive blow for Robbie,” said manager John McGlynn. “He’s been doing well, and he’s a top professional, but he’s been hit with as bad an injury as he could have got. “This season has been a nightmare with injuries, and the more we get, the more difficult the job becomes. Dean Lyness will take over the gloves for the remainder of the season with recently turned 17-year-old Sam McGuff set to provide cover after the SPFL turned down Rovers request to sign a more experienced goalkeeper on an emergency loan. “It’s massively disappointing because the rules would suggest we are in a position to get an emergency goalkeeper in, but that’s not what they are saying,” McGlynn said. “The SPFL say they’ve already turned down similar requests from two other clubs since April 1, which just shows the need for this. “Scottish football is on its knees financially at the level we’re working at, and it’s just crazy for them not to allow us and other clubs to bring somebody else in to get over these circumstances. “They’re talking about integrity, but we’re possibly going to have to put young Sam in goals at some point between now and the end of the season. Rovers have other injury concerns ahead of the visit of Stranraer this Saturday with a number of players feeling the strain from the Stenhousemuir astroturf last week. 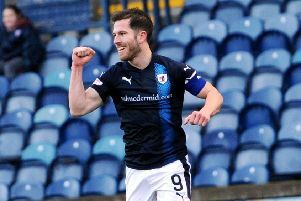 Iain Davidson, who has been nursing a back problem, was not risked on the surface, described by McGlynn as the worst in the league, but other players have been affected. McGlynn stopped short, however, of blaming the park for Thomson’s injury. “We don’t know – we can’t really tell that,” he said. “I just know that all the players are sore after playing on it on Saturday. “It’s the worst park in the league for it being so firm. “I don’t know how their players train and play on it so regularly. We’ve got shock absorbers in ours, which gives it a bit of cushion, so that’s the big difference. McGlynn expects another tough game against a Stranraer side in a similar position fighting relegation. “It always seems the case in this league that teams are never that far away from a win that can galvanise them and give them hope and spirit,” he said. “We had that situation last week with Stenny beating Dumbarton away from home the previous week, now Stranraer have beaten Forfar, who just had the manager and player of the month awards.